Entirely abandoning the Microsoft Windows operating system to another platform has always seemed inapplicable. Someone like me, for instance, has been working with Windows ever since Windows 3.0. With loads of accumulated documents, software and experiences, it's really hard to start all over. But with the Linux distributions growing more mature, I thought to give it a try and see if one can really abandon the Windows. It's been three months now, and I'm spending more than 95% of my computer time on Ubuntu, so I'm willing to say/pretend that it's a very close to entirely abandoning Windows. Note: this experiment does not cover gaming, as I'm not a gamer, myself. Editing MS-Office 2007/2010 documents: From my past experiences with the various Linux distros, it was never a problem dealing with the old MS-Office document formats (.doc, .xls, .ppt). Dealing with the new (.docx, .xlsx and .pptx) formats was something I must experiment with and be confident about. Accessing my corporate email server (MS-Exchange Server): My company works with Exchange server [period]. Installing Eclipse with the Android SDK: As I'm experimenting with the Android platform these days, having my familiar IDE (eclipse with the ADK) is something I'm concerned about. Accessing MS-SQL database (which resides on another server): In my work, I prepare lots of reports, mostly excel-based, that read from MS-SQL server database. It's very important for me to be able to read and modify an MS-SQL database from within my computer to produce such reports. Up to the time of writing these lines, I've succeeded in the first 3 items, with various degrees, still working on the 4th item and haven't started yet on the 5th. Downloading and installing the Ubuntu 11.1 (64bit) was fairly straight forward. Plugging-in my 3G modem and installing last-minutes updates was also a breeze. Thunderbird installs automatically with the Ubuntu 11.1 (oneiric). But Thunderbird does not have support for MS-Exchange Server, due to proprietary issues by Microsoft. In this regard, I found DavMail (http://davmail.sourceforge.net) to be a good solution. For us, newbies, we can think of DavMail as a translator. 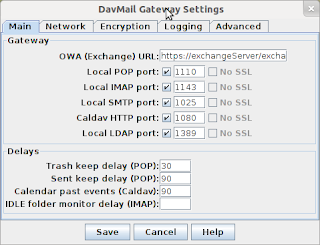 DavMail connects to the web interface of the MS-Exchange server (Outlook Web Access), and works as a server for the EMail client. 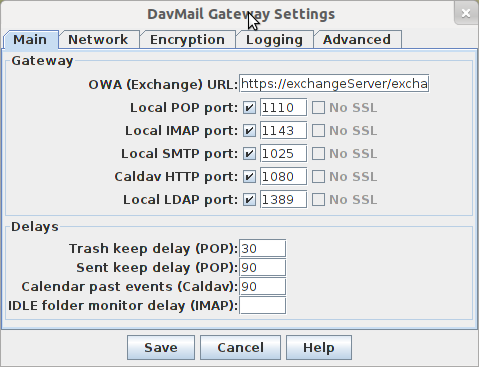 When using DavMail, Thunderbird sees itself connecting to a local IMAP server (setup at localhost). I would recommend using DavMail with the Gnome shell, not Unity, as the program defines its tray icon using FreeDesktop, which is not supported by Unity. Installing DavMail is very simple, if you use the deb package found here. It is simply a matter of double-clicking the deb package file, and choosing install. After the installation finishes, it's time to start configuring DavMail. Launch the application. This brings the shown dialog. In the OWA (Exchange) URL field, I entered my company's webmail address. Clicked "Save" and went for setting up the account in Thunderbird. The version of Thunderbird packaged with oneiric was not the latest. Googling a little, turned out this article about adding the repository ppa:ubuntu-mozilla-security/ppa and installing/upgrading Thunderbird in its latest version. Haven't installed Lightening, yet, I thought to setup the mail account first. In Thunderbird, I created the new IMAP account. Name, email and password are what you expect them to be. Servers Login name should be in the format: domain\login_name, meaning that if your email is my_name@my_domain.com, it is most likely that the login name would be my_domain.com\my_name. SSL, by default, is to be set to None, and the Authentication to "Normal password". Did the test, and verified that the connection between Thunderbird and DavMail is working.